Home - GraEagle Construction, LLC. 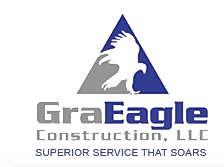 GraEagle Construction LLC, is all about service; giving you, our client, the freedom to focus on the most important things in your life. Our aim is to soar through the insurance repair process to make your life simpler, your job easier and leave you with satisfied customers each and every time. GraEagle Construction is dedicated to providing the same quality work from the smallest water damage repair to the largest fire restoration. We have a passion for what we do and the service we provide. It is time to raise the standards in the insurance repair field and our team at GraEagle Construction is committed to doing just that. Our aim is to soar through the insurance repair process to make your life simpler, your job easier, and leave you with satisfied customers each and every time. Fire, Water, Smoke, Motor Vehicle Damage, Mold Remediation Referral, Vandalism, Burglary, Reconstruction. State Farm Premier Service Program (PSP), American Family's Home Repair Program (HRP). "From start to finish...EVERYONE at GraEagle was professional! Thank you for getting our lives back on track!!!" GraEagle always did great work doing ADA home adaptions throughout the valley. When I worked for a local nonprofit, we contracted with them to do various modifications that allowed individuals with disabilities. I had water damage in my home from my hot water heater leaking. Jerry is extremely friendly, reliable and professional. Scheduling an estimate was quick and easy. All my questions were answered and I knew what to expect from the get go.